There is something magical about winter wedding photos. From twinkling lights to powdery snow, this season creates the perfect romantic setting for a couple. But whether it’s the big day, pre-wedding photos, or engagement photos, winter also poses a unique issue- it’s cold! When it comes to wedding photography, we know that being cold is never fun, especially when getting your picture taken. Here are a few tips they recommend for staying warm. We get it, no one wants a bulky winter jacket in their pictures, even if it’s a more casual engagement shoot and especially not if you’re in your gown/tux. Bring a warm jacket with you regardless and simply take it off before the shoot begins. When you move to another spot or the photographer is adjusting the camera, slip it back on to stay warm! If the bride is wearing a long gown, consider wearing warm winter shoes under. It might not feel as pretty, but you’ll be grateful that you did. Walking in heels in the winter is especially challenging. Not only is it cold, but there is also the risk of slipping! While outdoor winter wedding photos are gorgeous, inside ones can be just as beautiful. Almost every Toronto location decorates for the holidays, so take advantage of that! Your wedding photographer can also do a combination, some indoor and some outside so you get the best of both worlds. The great thing about Toronto is that there are heating lamps in lots of outdoor locations. Consider shooting in a place that has them. This means you can hang close to one during the downtime of the photo shoot. These photos are for your wedding; so don’t be afraid to cuddle up to your significant other! Take advantage of the cold and stick close to one another. Body heat is the best way to stay warm after all! As much as the cold is an issue, our wedding and engagement photographers love winter photo shoots. Winter is a magical and happy time, and it compliments couples so well. From the decorations to the weather, the season sets the perfect mood. 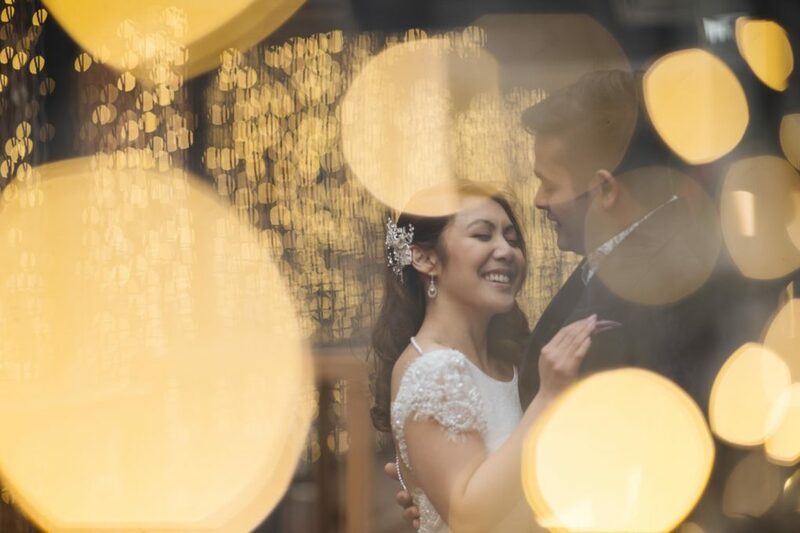 Contact us today to book one of our amazing Toronto wedding photographers!